We’ve previously talked about the early vote game in Ohio and how the early numbers looked good for Republicans and not so good for Ohio Democrats. But those numbers were only looking at absentee ballot requests by mail. Now that early voting is almost complete, how are things looking for Mitt Romney and down-ticket Republicans? They are looking very good. These numbers were released from the Romney campaign this morning, and include ALL early voting, both by mail and in-person. Democrats have cast 557,177 ballots. A decrease of 154,911 from 2008. Republicans have cast 480,843 ballots. An increase of 108,345 from 2008. That’s a net difference of 263,256 votes in favor of Republicans. In 2008, Barack Obama won Ohio by a margin of 262,224. Incredibly, before election day has even arrived, it appears that Mitt Romney has completely eliminated Obama’s margin of victory. Think they’re worried about this? You bet they are. Check out Obama advisor David Axelrod on Fox News this morning. When asked about these numbers, he doesn’t offer his usual smarmy reply. He has no response. Considering that most polls show that independents are significantly favoring Romney, its possible that he has a decent lead banked away in those early votes, before Tuesday voting even starts. The good news doesn’t end there. 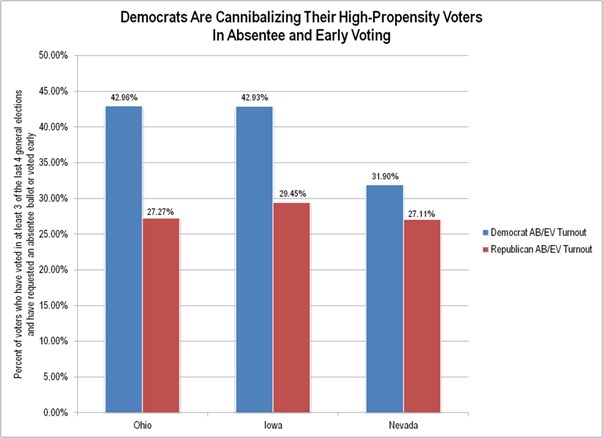 Data also shows that Democrats have “cannibalized” many more of their high-propensity voters than Republicans have. High-propensity voters include those who have voted in at least 3 of the last 4 elections. They are the most reliable voters, the ones like you and me. While Ohio Democrats have focused on getting their reliable voters to bank their votes early, Republicans have concentrated on getting more “low-propensity” voters to vote early, since they aren’t as reliable to count on on Election Day itself. Check out the chart below. Democrats have turned out almost 43 percent of their high propensity voters in Ohio, while Republicans have only turned out 27 percent. So, at the end of early voting, Republicans have erased Obama’s 2008 lead, and have many more reliable voters left to vote on Election Day than the Democrats. In fact, the RNC says that Republicans have 368,000 more high-propensity voters left than the Dems do, or a 71% advantage. Credit also goes to Governor Kasich for helping to put in place the new leadership team at the Ohio Republican Party. The ground game in Ohio has been incredible this year. We’ve heard a lot of talk about how close the contest is in Ohio, including from yours truly. But wouldn’t it be a pleasant surprise and a sigh of relief if Mitt Romney wins Ohio much more easily than most people expect? If he does, he will almost certainly be the next President of the United States.